God of the Gaps. Why God and science are not competing explanations. -A comment made, in various versions, by multiple atheist commenters to this website. 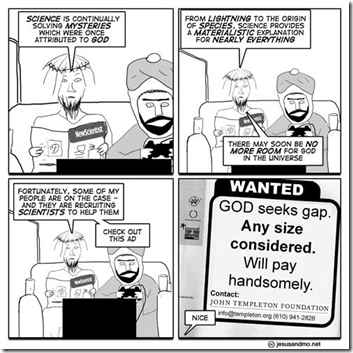 The cartoon above provides a good depiction of how many (perhaps most) atheists perceive God. They perceive him as an explanation for natural phenomena that competes with scientific explanations, and that serves to fill gaps in scientific understanding. But this perception is completely flawed and misguided. And, among atheists, Barker is certainly not alone. A review of comments made by atheists at this website (or virtually any other website where God’s existence is debated) will quickly reveal that many (perhaps most) atheists consider God and science to be competing explanations for natural phenomena, such as thunder and lightning, or the phenomenon of life. God, according to this atheist view, is only necessary to fill gaps in current scientific understanding….”the God of the gaps.” Eventually science will fill the last of these gaps and then there will be no longer be any need for God whatsoever. Citing a natural mechanism as an alternative explanation to God is what is known as a “category error” in philosophy. Lennox’s above comments call attention to a grave oversight that is pervasive in atheist reasoning: Citing a natural mechanism behind a natural phenomenon is NOT equivalent to explaining the ultimate source for that phenomenon. In Lennox’s words, “We should not confuse the mechanisms by which the universe works either with its cause or its upholder.” Put more simply, it is impossible to cite a natural mechanism as the source of the natural world because natural mechanisms are an aspect of the natural world. An aspect of something cannot be cited as the cause for that something. Citing a natural mechanism behind a natural phenomenon is NOT equivalent to explaining the ultimate source for that phenomenon. Any time a natural mechanism is cited as the cause of a natural phenomenon, a scientific explanation has been proposed….but an ontological explanation for the source of this mechanism has NOT been proposed. These are two separate questions. In simpler terms, science discusses questions of intermediate (or natural) causes, and ontology discusses questions of fundamental (or ultimate) causes. Science cannot study the premises upon which science is based. Questions that are of a fundamental nature cannot be answered by science. As an illustration, consider the question of why 2 + 2 = 4. Such a question cannot even be subjected to scientific study because it discusses a FUNDAMENTAL mathematical premise. Will a scientific experiment conducted sometime in the future finally reveal to the world why 2 + 2 = 4? Of course not, because such a fundamental mathematical premise is something which underlies science and is therefore meta-scientific. Scientific inquiry can contribute to ontological reasoning, but it cannot replace ontological reasoning. Scientific question: What accounts for the diversity of life on Earth? Proposed scientific answer to the above question: A mechanism known as the random mutation of genes and the natural selection of reproductive offspring is responsible for the diversification of life (Darwinism). Ontological question: What is the source of this above mentioned mechanism? (Please read Why Evolution Cannot Be Used To Rationalize Atheism and Riddles for Atheists for a more thorough exploration of this topic). Atheist answer to the above ontological question: ??????????????? (Atheist commenters to this website are encouraged to furnish any answers they wish). Theist answer to the above ontological question: A conscious and intelligent being, God, is the fundamental ground of reality, and the mechanisms we experience in nature are the product of this being. Please note that Einstein says this “miracle” is “constantly reinforced,” rather than diminished, “as our knowledge expands.” If inanimate matter is the fundamental ground of reality, why is the universe comprehensible rather than chaotic, and why is it so ordered, rather than disordered? Citing a natural mechanism or a physical law does NOTHING to answer such questions because three fundamental, ontological questions remain unanswered: 1) Where do natural mechanisms and physical laws come from? 2) If matter is the fundamental ground of reality, how can matter be compelled to do anything, much less follow a physical law (or “regularity” if you prefer)? 3) Why these laws and not laws that allow for chaos and disorder? The theistic model places consciousness (God’s consciousness) as the fundamental ground of reality, which is much in line with modern physics (as demonstrated in God Is Real…Why Modern Physics Has Discredited Atheism). And if God’s consciousness is the fundamental ground of reality, and our world is a manifestation of this consciousness, it is immediately clear why there is such a “high degree of ordering of the objective world.” But if matter is the fundamental ground of reality (as with atheism) the question of where this ordering comes from is completely unanswered. In summary, atheists who argue that scientific explanations are an alternative to God either confuse, or deliberately conflate, science and ontology. We are not dealing with a “God of the Gaps,” but rather, as Lennox puts it, we are dealing with a “God of the whole show.” Atheists frequently try to frame the debate as God vs. science so as to distract attention from the inadequacy, or rather bankruptcy, of their ontological reasoning. Scientific questions demand scientific answers, and ontological questions demand ontological answers. Therefore, answering such ontological questions as why there is such a “high degree of ordering of the objective world,” and why the world is comprehensible rather than chaotic (as Einstein marvelled at), by saying, “I don’t know, but science may someday figure it out,” simply has no value. Scientific and ontological explanations can and must interact, but science cannot by itself produce an ontological explanation because the scientific method cannot examine fundamental presuppositions that underlie science. Extra-scientific, and therefore philosophical/religious reasoning is a necessary part of the explanatory equation*. *Please read I Believe in Science! Why Do I Need Religion?! for a further exploration of the necessity for extra-scientific, and therefore philosophical/religious reasoning. ← I believe in science! Why do I need religion?! Atheists may try to assert that we shouldn’t try to make things up to try to understand why we’re here or give our lives meaning. However, doesn’t this just mean that you give life the meaning of no meaning? Is anyone in accordance or am I talking nonsense? There would be no such human concept as meaning if the universe had no meaning. Whoa. That all just hit me Scott. Thank you so much. I can’t express the gratitude. For me that solves it all. Thank you. It’s my pleasure. By the way, C.S. Lewis was full of such insights. I highly recommend that you read his books. You may want to start with Mere Christianity. Something occurred to me, and it seems to be a good contribution to the above discussion –too late by now, but hopefully it will be useful in another post? My primary aim in commenting is being useful. What I realized is that if atheism is true, a paradoxical conclusion is derived. The Postmodernists would still be wrong (facts would still exist), but Nietzsche (who denied the existence of truth) would be right. Truth only exists if we meet these two conditions: Firstly, there must be such a thing as a fact. What size are Sherlock Holmes’ shoes? There isn’t any fact to the matter. No possible answer could be given, as none of them would be true. None of them would be false either. This involves the second condition, which is Language can describe reality. For atheism to be the correct position, facts about God must exist. Namely, His non-existence. However, atheism gives us no assurance that language can describe reality. In fact, the concept of a meaningless universe precludes it, as language cannot describe a meaningless universe. The only thing that bothers me about this conclusion is how it could be turned on its head. I may have given the atheist invincible armor, so they can waive away any argument for God’s existence that rears its head. An irrational universe would not be expected to give evidence exclusively for the truth about its nature; maybe the universe really IS only six thousand years old? In an irrational universe, we would not be able to know. The comfort in this, however, is that it forces the atheist off his high-horse, as he is no longer the purveyor of rationality. Plus, the fact that he could communicate such a proposition indicates that it is false anyway. I immediately linked this page on my blog and intend to “advertise” the blog tonight on mine. The world is starving for more critical thinkers who are able to express themselves well to others. The world is full of people who do not THINK!!! It is frustrating to attempt to present evidence to the brainwashed masses, those who refuse to so much as audit their own worldview, let alone any aspect of what they have been taught to mindlessly repeat to their teachers in what passes for science classes in public schools. Awesome! Thanks for the support, Radar. By far one of the best articles I have ever read on this subject and I have read many. Accessible to all levels and succinct well don .. book marking permanently as a reference. Thank you for taking time out of your life to write this. Thanks very much! I appreciate the positive feedback! Fantastic article!!! Linked and posted and recommended around my circle…Since it was believers in the logical Creator God that founded the sciences in the first place, it is both ironic and foolish that so-called scientists deny the existence of God and promote a fatally flawed hypothesis as fact instead. Perhaps you will consider making a post in honor of Question Evolution Day on or around Darwin’s birthday? Absolutely. Just give me a reminder beforehand. Hi Scott. Would you agree also then that scientific or natural reasoning can’t be used to parse religious claims? IOW, there is no logical way to determine if Hinduism, Christianity, or Santeria is ‘true’? I frankly think most atheists would be happy as clams to maintain a line between the natural and measurable and the religious. The problem for both sides is when ‘truth’ – which, as you state here, cannot be determined by rational means – is interjected as somehow binding. And do you recognize that science *has* moved the bar? Questions there were once ontological and mysterious have indeed been explained by use of the scientific method. We now understand that the earth doesn’t rest on anyone’s shoulders precisely because of rational investigation apart from religious dictum. I think the question is much more messy that you describe. Science is the study of nature, and the possibility of science depends upon one’s attitude toward nature. Biblical religion gave to Western culture several of its fundamental assumptions about the natural world. Science rests not only on metaphysical convictions but also on convictions about value. A society must be persuaded that nature is of great value, and hence an object worthy of study. The ancient Greeks lacked this conviction. The ancient world often equated the material world with evil and disorder; hence, it denigrated anything to do with material rial things. Manual labor was relegated to slaves, while philosophers sought a life of leisure in order to pursue the “higher things.” Many historians believe this is one reason the Greeks did not develop an empirical science, which requires practical, hands-on observation and experimentation. In Biblical teaching, nature is good, but it is not a god. It is merely a creature. The Bible stands firmly against any deification of the creation. Pagan religions are typically animistic or pantheistic, treating the natural world either as the abode of the divine or as an emanation of God’s own essence. Dutch historian of science R. Hooykaas describes this as the “de-deification” deification” of nature.” Natural phenomena-sun, moon, forests, rivers-are no longer seen as the locus of deity, no longer objects of religious awe and reverence. They are creations of God, placed in the world to serve His purposes and contribute to human welfare. The de-deification of nature was a crucial precondition for science. As long as nature commands religious worship, dissecting her is judged impious. As long as the world is charged with divine beings and powers, the only appropriate response is to supplicate them or ward them off. In the words of seventeenth-century chemist Robert Boyle, the tendency to regard nature as sacred “has been a discouraging impediment” to science. Science is not merely a method of inquiry; it begins with an intellectual stance vis-a-vis the natural world. As Cox writes, “however highly developed a culture’s powers of observation, however refined its equipment for measuring, no real scientific breakthrough is possible until man can face the natural world unafraid.” The monotheism of the Bible exorcised the gods of nature, freeing humanity to enjoy and investigate it without fear. When the world was no longer an object of worship, then-and only then-could it become an object of study. Christianity furnishes the conceptual framework in which science can flourish. Science is not something that is natural to mankind. As science writer Loren Eiseley has emphasized, science is “an invented cultural institution” which requires a “unique soil” in order to flourish. Although glimmerings of science appeared among the ancient Greeks and Chinese, modern science is the child of European civilization. Why is this so? It is due to the unique contribution of the Christian faith to Western culture. As Eiseley states, “it is the Christian world which finally gave birth in a clear, articulate fashion to the experimental method of science itself.” In contrast to pantheistic or animistic religions, Christianity does not view the world as divine or as indwelt by spirits, but rather as the natural product of a transcendent Creator who designed and brought it into being. Thus, the world is a rational place which is open to exploration and discovery. “I do not think, however, that I have even yet brought out the greatest contribution of medievalism to the formation of the scientific movement. I mean the inexpungable belief that every detailed occurrence can be correlated with its antecedents in a perfectly definite manner, exemplifying general principles (causality). Without this belief the incredible labours of scientists would be without hope. It is this instinctive conviction, vividly poised before the imagination, which is the motive power of research: — that there is a secret, a secret which can be unveiled. How has this conviction been so vividly implanted on the European mind? “When we compare this tone of thought in Europe with the attitude of other civilizations when left to themselves, there seems but one source for its origin. It must come from the medieval insistence on the rationality of God, conceived as with the personal energy of Jehovah and with the rationality of a Greek philosopher. Every detail was supervised and ordered: the search into nature could only result in the vindication of the faith in rationality. Remember that I am not talking of the explicit beliefs of a few individuals. What I mean is the impress on the European mind arising from the unquestioned faith of centuries. By this I mean the instinctive tone of thought and not a mere creed of words.